The United States Congress designated the Meadow Valley Range Wilderness (map) in 2004 and it now has a total of 123,508 acres. All of this wilderness is located in Nevada and is managed by the Bureau of Land Management. The Meadow Valley Range Wilderness is a land of rolling bajadas speckled with cholla, yucca and Joshua trees, intricately carved canyons forested with pinyon pine and juniper, and jagged mountain peaks topped with stands of old-growth ponderosa pine. These peaks rise from 2,100 feet within the Wilderness boundaries to 5,022 feet. Each contains inspiring beauty and jaw-dropping surprises. Conical buff-based Sunflower Mountain sits astride the main ridgeline. A natural arch endures in the northern part. The various climates and elevations in these areas provide important habitat for a wide spectrum of wildlife. 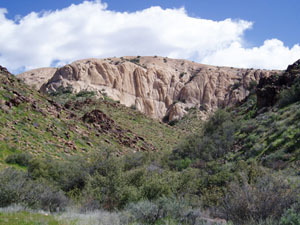 The low elevations provide crucial habitat for the desert tortoise, the banded Gila monster, the white bearpoppy, Clark mountain agave, desert banded gecko, the sidewinder and the long-nosed leopard lizard. Higher in the mountains, it’s possible to spot desert bighorn sheep, mule deer, bobcat and mountain lion. An impressive variety of raptors live in the area. Burrowing owl, golden eagle, ferruginous hawk, red-tailed hawk, prairie falcon, Cooper’s hawk, northern harrier, merlin and American kestrel are some of the birds of prey that have been spotted in the region. Vegetation consists of low desert shrub with the exception of the northern section of the Meadow Valley Mountains, which is pinyon and juniper forest. The Meadow Valley Range is boomerang-shaped, measuring approximately ten miles east to west, and arching about thirty-six miles from north to south. It consists of three major landforms; the long ridgeline of the Meadow Valley Mountains, a large bajada beginning high on the main ridge sloping easterly towards Meadow Valley Wash, and finally Bunker Hills five miles from the southern section of the central bajada. Even the ground itself offers a glimpse into the distant past. Fossils in the limestone hills give us snapshots of life hundreds of millions of years ago, when these high inland mountains were merely sediments accumulating at the bottom of the sea. And the mountains themselves give a bird's-eye view of nature's erosional forces at work. Planning to Visit the Meadow Valley Range Wilderness? How to follow the seven standard Leave No Trace principles differs in different parts of the country (desert vs. Rocky Mountains). Click on any of the principles listed below to learn more about how they apply in the Meadow Valley Range Wilderness.